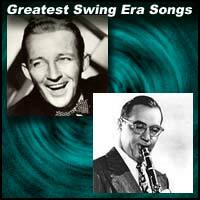 Background: The Swing Era was when big band swing music was at its most popular in America between the years 1935-1945. This music was heard in 3 places mainly. (1) mainstream AM radio ("Your Hit Parade" as so many formats were entitled back then), (2) the dance and concert halls where the big bands played, or soloists like Crosby sang & (3) the Armed Forces USO's and canteens. Symbols: (v) and (I) stand for vocal (present in recording) and Instrumental (all instrumental) respectively. Noted vocalists or instrumental soloists mentioned made an out-sized contribution to the recording. 414. I Don't Know Enough About You - Peggy Lee (1945). I. This list is not a pure Top 40 or Top 100 list from this era; for example, there is no Country & Western or much in the way of Blues records on this list. II. The main, or criteria #1, was: Were these songs likely to be heard or sung in the main big dance halls of the day, from Coast to Coast, where dancers did the swing dances like the Lindy, Jitterbug, L.A. Balboa, or just hung-out for boy-meets-girl purposes? III. Why are pure pop songs like "Over The Rainbow" and others included? Well, for one, many of the famous big bands of the day, like Glenn Miller, or Larry Clinton, for example, just to name two, came up with their own versions of the songs, and surely these were played and performed and sung before their audiences and dancers. Bea Wain's version with Larry Clinton big band made it to #10 on the Hit Parade, even though of course, only Judy Garland's is remembered, her mega-selling #1 from the movie. IV. It is not supposed to be a pure Jazz list, and that's why even some pure jazz influential and significant records of historical jazz importance are not included. This list is all about "Your Hit Parade" radio formats, and the live dance or concert hall (some many numerous ones throughout the country at the time, like the Glen Island Casino or Rouge Room at the Hotel Pennsylvania in New York, just to name two of thousands of performance and dance venues, and music played or records spun at USO's serving the fighting GI's overseas. 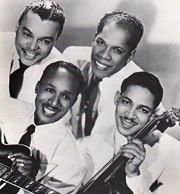 V. The record has to have either lasting importance to jazz (and mostly danceable jazz - the big band stuff mainly), to popular music as a whole, or had to have been influential to fellow musicians and songwriters of the day; or it had to have some lasting impact or critical accolade. Artie Shaw's "Stardust" was voted #1 popular record of all time by a national survey of radio DJ's in 1955, for example.